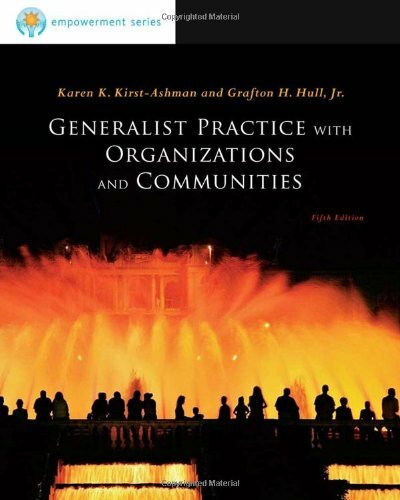 Get a practical, comprehensive, and clearly written introduction to the fundamentals of macro practice with BROOKS/COLE EMPOWERMENT SERIES: GENERALIST PRACTICE WITH ORGANIZATIONS AND COMMUNITIES, 5E, which is now available in paperback and thoroughly updated to reflect the Council on Social Work Education's (CSWE) latest ethical standards and contemporary issues in social work literature. The authors emphasize the practical skills needed for working successfully in macro practice--providing leadership, working with supervisors, managing conflict, working with the media, using new technological advances, fundraising, grant writing, managing stress, and working in court settings. Learn to build on the one-on-one and group communication skills identified by the authors for community and organizational change. This edition's realistic vignettes and practical features--hands-on tips, sample forms, and a running case study--aim to deepen your expertise and enhance your performance in the field. Karen K. Kirst-Ashman is Professor Emerita and former chairperson in the Social Work Department at the University of Wisconsin-Whitewater, where she taught for 28 years. She has written six social work textbooks in multiple editions and numerous publications, articles, and reviews on social work and women's issues. She also has served on the Editorial Board of AFFILIA: Journal of Women and Social Work, and as a consulting editor for many social work journals including the Journal of Social Work Education. Dr. Kirst-Ashman has been a member on the Board of the Council on Social Work Education (CSWE) and has served as a CSWE accreditation site visitor on various occasions. She is a Licensed Clinical Social Worker in the state of Wisconsin. She has been the recipient of both the University of Wisconsin-Whitewater Roseman Award for Excellence in Teaching and the University Outstanding Teaching Award. She earned her BSW degree and MSSW degree at the University of Wisconsin-Madison and her Ph.D. in social work at the University of Illinois at Urbana-Champaign. She has worked as a practitioner and administrator in child welfare and mental health agencies. Kirst-Ashman, Karen K.; Hull, Jr. Grafton H.